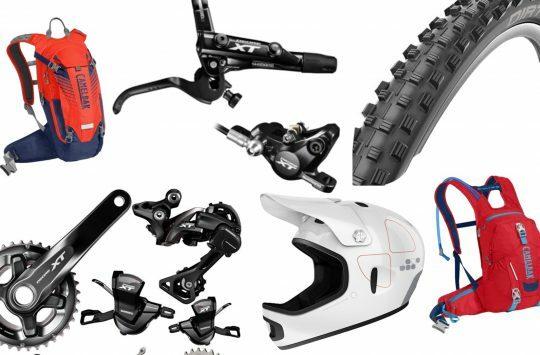 Founded circa 2012 by a (then) teenager, offerings from Germany’s Brake Force One have never hewed to industry trends. The brand’s composite bodies and one-finger levers have made their way into the mainstream- the reservoir-free design and glow-in-the-dark hoses not so much. Only time will tell how the brand’s latest innovation–water as hydraulic fluid–is received. That’s right: water. 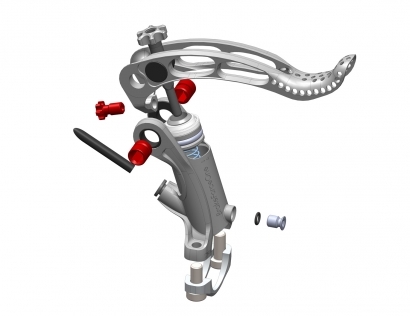 Brake Force One reason that water’s higher thermal capacity and lower thermal expansion than mineral oil make it ideal for removing heat from the caliper, spreading the thermal energy over a greater area and allowing it to dissipate harmlessly. Moisture contamination shouldn’t be an issue either and adding one part glycol to every four parts H2O makes them OK for winter riding. 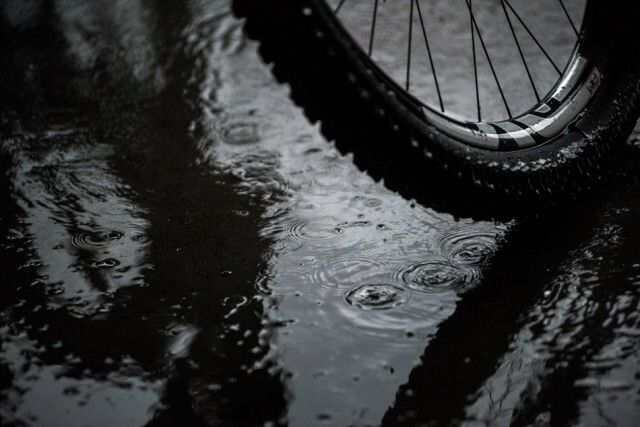 It may stop you from riding- but will it stop you while riding? With a two-stage piston doing much the same work as Shimano’s Servo-Wave system, the Brake Force One caliper is said to provide good pad clearance at rest pad and good power when braking. As in models past, the small-volume, low-pressure brake lines keep total expansion volume to a minimum- and as a result no reservior is provided to accommodate the phenomenon. 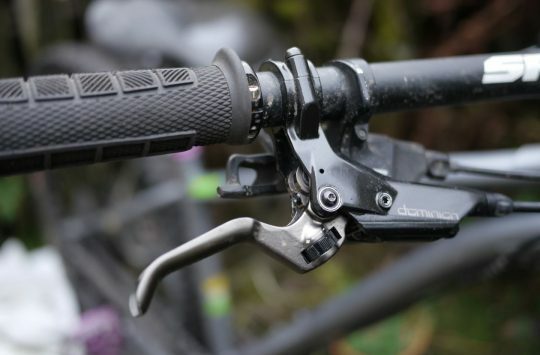 Also as a result, pad wear must be compensated for manually (hence the large knob at the front of the lever). If nothing else, Brake Force One continues to ask some interesting questions- and we’d love to hear how they perform in the real world. In true German boutique brand fashion, the lever and caliper closure are available in four colours. 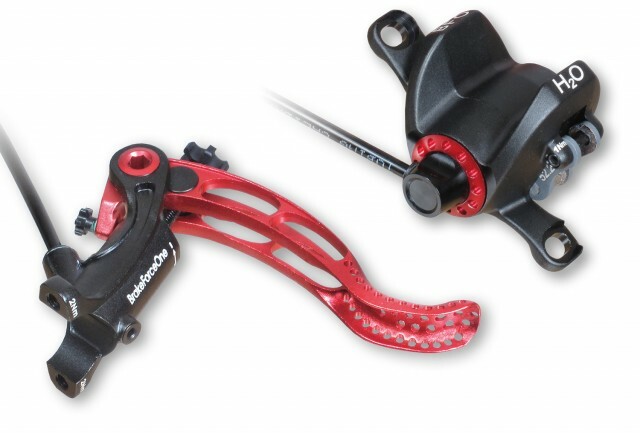 A front & rear set will run roughly £425, with rotors another £46. It’s hard to deny that there’s a lot of interesting here for the money- though ‘interesting’ isn’t necessarily the first thing that most of us look for in a brake. 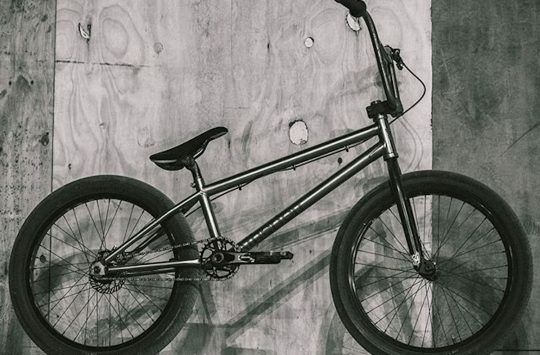 Atherton Bikes Unveils 2nd model, a Titanium BMX with 22in wheels and disc brake! Why not water? Usually the answer is because it boils at too low a temperature to be usable….what am I missing? Heat capacity refers to the amount of of energy needed to raise the temperature of a certain amount of material by a certain degree. But that in itself is irrelevant for suitability as brake fluid: let’s say x joules of energy will bring 1 kg of water from 0 to 100C, and that the same amount of energy will raise the temperature of 1 kg of mineral oil from 0 to 200C. In this case water is said to have twice the heat capacity of the mineral oil, but as long the mineral oil boils at a higher temperature than 200, the oil will still be the superior brake fluid. Lubrication? Both brake fluid and mineral oil lubricate the seals. Water won’t. I’m struggling to see how the fluid (water or otherwise) has much to do with this, most heat will be dissipated in the air passing the disc and the caliper body, with a bit being radiated. Granted the caliper is being heated via the pad and fluid but any difference in thermal capacity of the small volume of water will have a trivial effect. water boils at 100degC, this causes water to turn to gas and expand rapidly, possible blowing seals and scalding your leg, bit of gcse science for you there. @nickjb that is true but trials brakes don’t get as hot as disc brakes and running water alone leads to the pistons swelling and seals sticking without lubricant. You can counter it by mixing the water with some anti freeze though, wonder if that would work with these?